Joey O'Hare's inventive miso-charred aubergine salad recipe is full of deep and complex flavours, served with spicy fermented kohlrabi, a rich tahini mayonnaise and crunchy, aromatic dukkah. To make this recipe vegan, swap the fish sauce in the ferment to light soy sauce, and use maple syrup to glaze the aubergine instead of honey. With regards its culinary origins this dish is perhaps a little confused, yet it’s flavour is bold, harmonious and so exciting. The way the juices from the spicy fermented kohlrabi mingle with the tahini mayo is fantastic; it’s perfect mopped up with fresh sourdough. 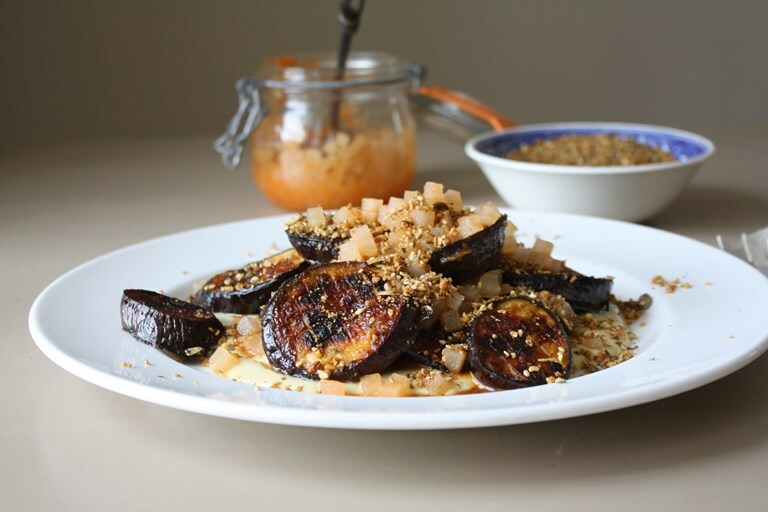 And the crunch of the dukkah is an awesome contrast to the soft and yielding aubergine flesh. Please note, I do include fish sauce, or nam pla, in the spicy fermented turnip recipe to give an authentic kimchi flavour. 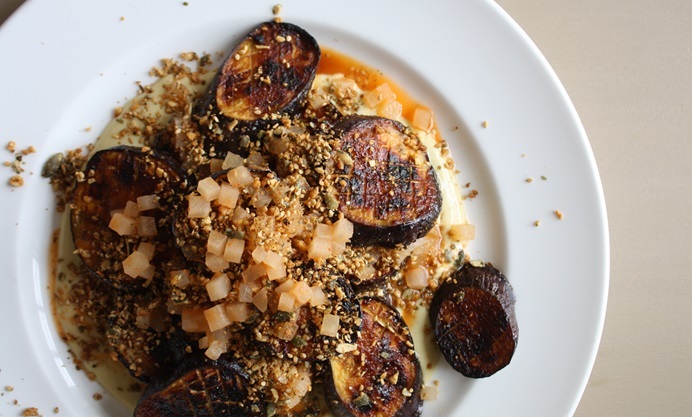 I also char the aubergine with honey, but to keep things wholly vegan feel free to use maple syrup or agave. The recipe for the spicy fermented kohlrabi is far larger than you will need for four people; it will last indefinitely in the fridge and is fabulous in so many quick recipes, including simple egg-fried rice and greens. Likewise the quantity of dukkah is large; it is brilliant to have to hand to jazz up all manner of vegetarian dishes, and will last up to a month in a sealed container at room temperature. This recipe serves 4 people as a starter, or light lunch if accompanied with sourdough bread and a green salad.